Some frequently asked questions about the park. Feel free to contact us with any others! The park is open dawn until dusk. Please pick up after yourself. There are trash and recycling receptacles located throughout the park for your convenience. Please use them in order to help us keep our park clean and litter free. Glass bottles are prohibited in the park. If you would like to make a donation towards the purchase of an “I Love Patterson Park” trash can, please email friends@pattersonpark.com. Please keep your dog on a leash and pick-up after your dog. Laws about Dogs: Article 11, Section 36 of City Ordinance #7081974 states that dogs must be on a leash 6’ or less at all times. Article 11, Section 30 states that all animal waste must be removed by owner. Unauthorized vehicles are not allowed in the park. A safer park for all is important to everyone, therefore the traffic laws in Patterson Park are strictly enforced. Only permitted and emergency vehicles are allowed in the park. All others will be ticketed. Contact Angie Wanner, Department of Recreation and Parks, at 410-396-9392 for vehicle permit information. Our Tree Team meets Spring, Summer and Fall to weed and mulch trees. The Pagoda Team cares for the flower gardens and cleans the Pagoda. We meet on the 2nd Sunday each month at 10am May – September. Pagoda Docents staff the Pagoda on Sundays mid-April through October, 12-6pm. The Boat Lake Team keeps our lake clean and meets on the 1st Saturday of every month April through November, at 8am. The Youth and Recreation Team helps facilitate free soccer programs. What are the pagoda hours? 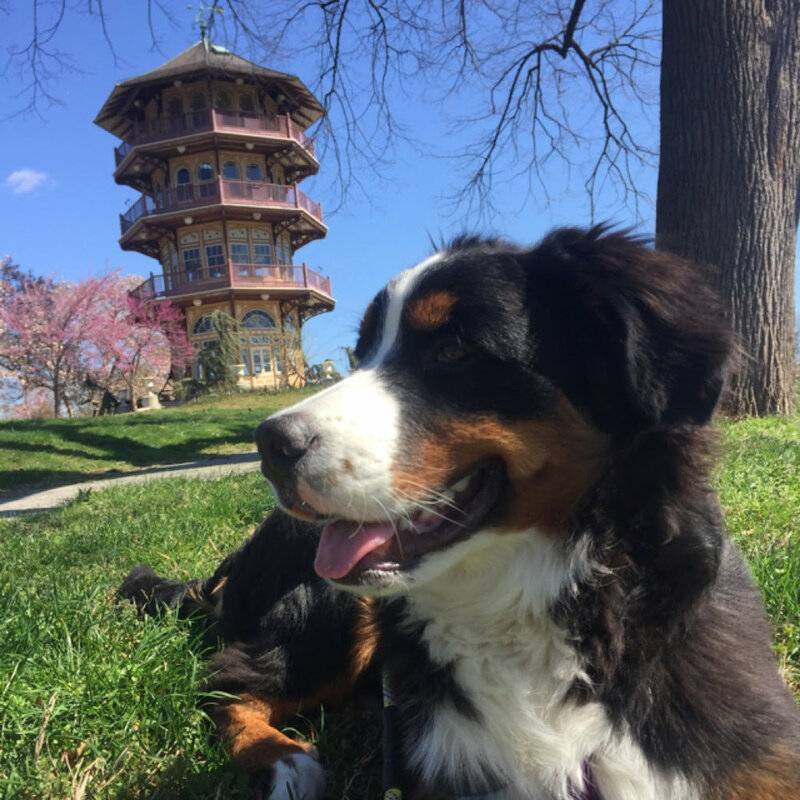 The Pagoda is open 12 pm to 6 pm on Sundays from mid-April through mid-October. How can I get a park permit? Please visit the Baltimore City Department of Recreation and Parks website for detailed information on how to obtain permits to use the pavilions, ball fields or to have a special event in Patterson Park. Questions about grilling in the park should also be directed to the permits office. On the website, you’ll find downloadable applications and information about the types of events that are allowed in the park. You may also contact the Permits Coordinator at (410) 396-7070 for more info. Do you allow community gardening? The Department of Recreation and Parks’ Horticulture Division maintains 7 community gardens around the City. Patterson Park is home to one of these gardens known as Patterson City Farms Garden. Community gardening has a long history in Patterson Park. In 1904 and again in 1913, the dedication of land for community-tended garden plots is discussed in Park Commission reports with a 1935 map depicting a large children’s garden. Photographs from the time confirm their existence and area residents have said that community-tended gardens or victory gardens have been in the park since World War II. Today, there are 92 plots in Patterson’s City Farms Garden that are 150 square feet each and are available for rent to residents. The cost per plot is $30 annually, which includes access to water, compost, soil and tools. Each year during the main harvest season, the city holds a City Farms Feast for all program participants. Do you have sports leagues? Patterson Park boasts almost three miles of paved paths for running, walking and biking, ten tennis courts, located along Linwood Avenue between Baltimore Street and Eastern Avenue, four full basketball courts, located near the pool; a swimming pool, open to the public between early June and late August; an ice skating rink opens from October through March for hockey, broomball and public ice-skating; and many multi-use playing fields. Walking, jogging, bicycling, tennis, basketball, organized and pick-up games of baseball, softball and soccer are some of the athletic pursuits undertaken in Patterson Park. How Do I Drive To The Park? The park is located between East Baltimore and South Pratt Streets on the North and Eastern Avenue on the South. From the North Take 83 South (turns into President Street) to Pratt Street. Make a left on Pratt and continue for 1 mile to South Patterson Park Avenue, our eastern boundary. From the South From 95 North, take 295 towards Baltimore. After passing Camden Yards, turn right onto Pratt Street. Follow for 2 miles until the street dead ends at the Park at South Patterson Park Avenue. Where can I find a park map? Click here to view both the general park map and a running trail map of Patterson Park.